One of the first steps towards making your deck look brand new again is to ensure that your deck is free of debris that could potentially deteriorate it over time. As you prepare to entertain for the remainder of the summer, it is important to ensure that your deck is in great shape for upcoming summer months. Winter weather and rainy spring days can often take a harsh toll on your outdoor space, causing it to appear older than it actually may be. 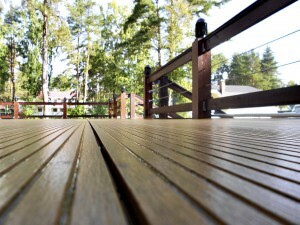 To get your deck looking brand new again, follow these simple summer deck maintenance tips. One of the first steps towards making your deck look brand new again is to ensure that your deck is free of debris that could potentially deteriorate it over time. Like any other space in your home, cleanliness is the key to maintaining this space over time. Be sure to sweep off leaves and rinse dirt or pollen build up off your deck as often as you can. This will keep it looking neat and well prepared for any parties, cookouts, or spontaneous gatherings at your home this summer. The appearance of your garden is another key factor in maintaining your beautiful deck, so it is especially important to keep plants, flowers, and stray branches around your space in check. Water, trim, and re-mulch your garden to refresh the look of your landscape, and let the summer rains take care of the rest! Regardless of how old or new your deck is, an occasional re-sealing or staining is often necessary to maintain its function and appearance in your yard. Wooden decks require exceptional care, as they must regularly be resealed to keep them smooth and free of cracks throughout the year. Because Maryland weather can unpredictable, it is critical to ensure that your deck is in excellent condition for whatever weather comes your way this summer. If you love to fire up the grill throughout the summer, it is important to keep your cooking area maintained to ensure that grease stains and loose charcoal do not stain your deck. In keeping your grilling area sectioned off with the right materials, you can enjoy cooking and roasting marshmallows on your deck all summer long. Ready to Update Your Deck?